The 2012 GMC Acadia SL crossover vehicle carries up to 8 passengers in its well-equipped cabin, thanks to 3 rows of seating, which include two front bucket seats, a second-row 60/40-split bench seat and a third-row 60/40-split fold-flat bench seat. Cloth upholstery, air conditioning, cruise control, remote keyless entry, a tilt/telescopic steering wheel and power windows and door locks are among the standard interior features. Tech features include standard OnStar with turn-by-turn navigation and 6 months of the Directions and Connections plan, and a 6-speaker AM/FM audio system with SiriusXM satellite radio. Power for the Acadia SL comes from a 3.6-liter V6 with direct injection and variable valve timing. Working with a Hydra-Matic 6-speed automatic transmission, the V6 puts out 288 hp and 270 lb-ft of torque, while managing fuel economy numbers of 17/24 mpg. Standard safety features include the StabiliTrak electronic stability control system with rollover mitigation, as well as 4-wheel antilock disc brakes and 6 airbags. In addition, the standard OnStar system includes such safety features as emergency assistance and stolen vehicle tracking. Outside, the Acadia SL displays such features as a black mesh grille, halogen foglights, LED taillights and dual chrome exhaust tips. The Acadia SL rides on 16-inch painted aluminum wheels with all-season tires. The 2012 GMC Acadia SL AWD crossover vehicle comes equipped with GM's fully automatic AWD system, which improves traction by shifting torque between the front and rear wheels based on wheel speed, throttle and road surface conditions. The AWD system channels power from a 3.6-liter V6 engine, which rolls over from the previous year unchanged. The V6 links to a Hydra-Matic 6-speed automatic transmission, and generates 288 hp and 270 lb-ft of torque. Fuel economy numbers check in at 16/23 mpg. GM's StabiliTrak electronic stability control system, as well as 4-wheel antilock disc brakes and 6 airbags, are among the standard safety features. Inside, the Acadia SL AWD seats up to 8 passengers in 3 rows, which includes two front bucket seats, a second-row 60/40-split bench seat and a third-row 60/40-split bench seat. Standard interior features include cloth upholstery, air conditioning, cruise control, remote keyless entry, a tilt/telescopic steering wheel and power windows and door locks. GM also includes such tech features as OnStar with turn-by-turn navigation and 6 months of the Directions and Connections plan, and a 6-speaker AM/FM audio system with SiriusXM satellite radio. Exterior features include a black mesh grille, halogen foglights, LED taillights, dual chrome exhaust tips and 16-inch painted aluminum wheels. The 2012 GMC Acadia SLE crossover vehicle seats 7 passengers in 3 rows, which includes two front bucket seats, second-row captain's chairs and a third-row 60/40-split bench seat. Owners can opt for a second-row bench seat, increasing seating capacity to 8, at no extra cost. The SLE comes equipped with a number of standard features not found on the entry-level SL trim, including an 8-way power-adjustable driver's seat, a 2-way power-adjustable passenger seat, a leather-wrapped steering wheel, an auto-dimming rear-view mirror and remote vehicle start. In addition, GM adds Bluetooth to the SLE's 6-speaker AM/FM audio system. Cloth upholstery, air conditioning, cruise control, a tilt/telescopic steering wheel and power windows and door locks are among the other standard interior features. In addition, the SLE receives the OnStar system with turn-by-turn navigation and 6 months of the Directions and Connections plan. A 3.6-liter V6 engine powers the Acadia SLE. Paired with a Hydra-Matic 6-speed automatic transmission, it puts out 288 hp and 270 lb-ft of torque, while managing fuel economy numbers of 17/24 mpg. Safety features include GM's StabiliTrak electronic stability control system, as well as 4-wheel antilock disc brakes and 6 airbags. In addition, the OnStar system includes such safety features as automatic crash response and emergency assistance. GM also adds rear park assist and a rear-view camera system integrated into the rear-view mirror. Outside, the Acadia SLE displays such standard features as new body-color side moldings, halogen foglights, LED taillights and dual chrome exhaust tips. The Acadia SLE rides on 16-inch painted aluminum wheels. The 2012 GMC Acadia SLE AWD delivers optimal stability, thanks to its fully automatic AWD system, which improves traction by shifting torque between the front and rear wheels based on wheel speed, throttle and road surface conditions. For power, the Acadia SLE AWD receives a 3.6-liter V6 engine, which mates to a Hydra-Matic 6-speed automatic transmission. The V6 produces 288 hp and 270 lb-ft of torque and posts fuel economy numbers of 16/23 mpg. Standard safety features include GM's StabiliTrak electronic stability control system, as well as 4-wheel antilock disc brakes and 6 airbags. GM also adds rear park assist and a rear-view camera system integrated into the rear-view mirror. The Acadia SLE AWD seats 7 passengers in 3 rows, which includes two front bucket seats, second-row captain's chairs and a third-row bench seat. Owners can opt for a second-row bench seat, increasing seating capacity to 8, at no extra cost. The SLE receives a number of features not found on the entry-level SL trim, including an 8-way power-adjustable driver's seat, a 2-way power-adjustable passenger seat, a leather-wrapped steering wheel, an auto-dimming rear-view mirror and remote vehicle start. GM also adds Bluetooth to the SLE's 6-speaker AM/FM audio system. Other standard interior features include cloth upholstery, air conditioning, cruise control and power windows and door locks. GM also equips the SLE AWD with the OnStar system, which includes turn-by-turn navigation and 6 months of the Directions and Connections plan, as well as such safety features as automatic crash response and emergency assistance. Outside, the Acadia SLE AWD displays new body-color side moldings, halogen foglights, LED taillights, dual chrome exhaust tips and 16-inch painted aluminum wheels. The mid-level GMC Acadia SLT1 crossover vehicle comes well-equipped for 2012, with such standard features as leather upholstery for the first two rows, as well as heated front seats. The SLT1 also includes tri-zone automatic climate control, an upgraded instrument cluster with an Enhanced Driver Information Center and a 10-speaker Bose audio system with Bluetooth and a USB port. Power-adjustable front seats, a leather-wrapped steering wheel, a power rear liftgate, remote keyless entry and vehicle start, power windows and door locks, and OnStar with turn-by-turn navigation are among the other standard features. The Acadia SLT1 seats 7 passengers in 3 rows, which includes second-row captain's chairs and a third-row, 60/40-split fold-flat bench seat. The Acadia SLT1 receives a number of exterior features that distinguish it from lower-end trims, including bright beltline molding, 19-inch machined-aluminum wheels and heated power side mirrors with an integrated spotter mirror that provides a view of the driver's blind spot. Under the hood, GM drops a 3.6-liter V6 engine, which links to a Hydra-Matic 6-speed automatic transmission. The V6 generates 288 hp and 270 lb-ft of torque, while managing fuel economy numbers of 17/24 mpg. Standard safety features include GM's StabiliTrak electronic stability control system, as well as 4-wheel antilock disc brakes and 6 airbags. In addition, the OnStar system includes such safety features as automatic crash response and emergency assistance. GM also adds rear park assist and a rear-view camera system integrated into the rear-view mirror. GMC equips the 2012 Acadia SLT2 AWD with a wide range of upscale features, as well as a fully automatic AWD system, which improves traction by shifting torque between the front and rear wheels based on wheel speed, throttle and road surface conditions. Unique exterior features for the SLT2 AWD include bright beltline molding, LED taillights, dual chrome exhaust tips, 19-inch machined-aluminum wheels and heated power side mirrors with an integrated spotter mirror for the driver's blind spot. Inside, the SLT2 AWD comes equipped with a number of features not found on lower-end trims, including a 4-way power-adjustable passenger seat and memory settings for the 8-way power-adjustable driver's seat and the heated power-adjustable exterior mirrors. Other upscale features for the SLT2 AWD include leather upholstery for the first two rows, heated front seats, a leather-wrapped steering wheel, a power liftgate and a 10-speaker Bose audio system with Bluetooth and SiriusXM satellite radio. GM also includes its OnStar system with turn-by-turn navigation and 6 months of the Directions and Connections plan. In addition, a number of options are available only on the SLT2 trim, including HID headlights, perforated leather upholstery, heated and cooled front seats, a heads-up display and rear audio controls. A 3.6-liter V6 engine powers the SLT2 AWD. It generates 288 hp and 270 lb-ft of torque and mates to a Hydra-Matic 6-speed automatic transmission. Fuel economy numbers check in at 16/23 mpg. Standard safety features include 6 airbags, 4-wheel antilock brakes and GM's StabiliTrak electronic stability control system with rollover mitigation. In addition, the OnStar system includes such safety features as automatic crash response and emergency assistance. GM also adds rear park assist and a rear-view camera system integrated into the rear-view mirror. The 2012 GMC Acadia SLT1 AWD crossover vehicle combines upscale features and optimal stability, thanks to such features as its fully automatic AWD system, which improves traction by shifting torque between the front and rear wheels based on wheel speed, throttle and road surface conditions. Outside, the SLT1 AWD displays a number of exterior features not found on lower-end trims, including bright beltline molding, 19-inch machined-aluminum wheels and heated power side mirrors with an integrated spotter mirror that provides a view of the driver's blind spot. Other exterior features include halogen foglights, LED taillights and chrome exhaust tips. For power, the Acadia SLT1 AWD comes equipped with a 3.6-liter V6 engine, which mates to a Hydra-Matic 6-speed automatic transmission. The V6 generates 288 hp and 270 lb-ft of torque and posts fuel economy numbers of 16/23 mpg. Six airbags, 4-wheel antilock brakes and GM's StabiliTrak electronic stability control system with rollover mitigation are among the standard safety features. Inside, GM equips the SLT1 AWD with a number of upscale features, including leather upholstery for the first two rows, heated front seats and tri-zone automatic climate control. The SLT1 AWD also receives an upgraded instrument cluster with an Enhanced Driver Information Center and a 10-speaker Bose audio system with Bluetooth and a USB port. Power-adjustable front seats, a leather-wrapped steering wheel, a power rear liftgate, remote keyless entry, remote vehicle start and power windows and door locks are among the other standard features. In addition, the SLT1 AWD's OnStar system includes turn-by-turn navigation and 6 months of the Directions and Connections plan, as well as such safety features as automatic crash response and emergency assistance as well. The Acadia SLT1 AWD seats 7 passengers in 3 rows, which includes second-row captain's chairs and a third-row, 60/40-split fold-flat bench seat. However, owners can opt for a second-row bench seat, which expands passenger capacity to 8. GM equips the 2012 GMC Acadia SLT2 AWD with a wide range of upscale features, as well as a fully automatic AWD system, which improves traction by shifting torque between the front and rear wheels based on wheel speed, throttle and road surface conditions. Unique exterior features for the SLT2 AWD include bright beltline molding, LED taillights, dual chrome exhaust tips, 19-inch machined-aluminum wheels and heated power side mirrors with an integrated spotter mirror for the driver's blind spot. Inside, the SLT2 AWD comes equipped with a number of features not found on lower-end trims, including a 4-way power-adjustable passenger seat and memory settings for the 8-way power-adjustable driver's seat and heated power-adjustable exterior mirrors. Other upscale features for the SLT2 AWD include leather upholstery for the first two rows, heated front seats, a leather-wrapped steering wheel, a power liftgate and a 10-speaker Bose audio system with Bluetooth and SiriusXM satellite radio. GM also includes its OnStar system with turn-by-turn navigation and 6 months of the Directions and Connections plan. In addition, a number of options are available only on the SLT2 trim, including HID headlights, perforated leather upholstery, heated and cooled front seats, a heads-up display and rear audio controls. 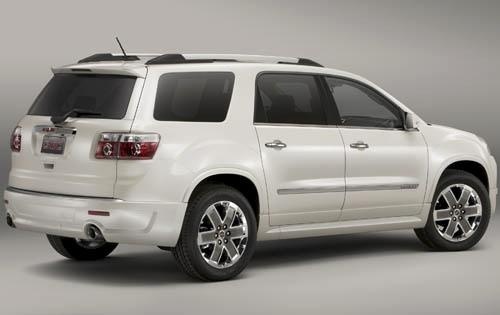 With its long list of standard features, the GMC Acadia Denali AWD remains the best-equipped Denali for 2012. It seats up to 7 passengers in 3 rows, including second-row captain's chairs and a third-row fold-flat bench seat. Upscale features include perforated leather upholstery for the first two rows of seating, heated and cooled front seats, an 8-way power-adjustable driver's seat, a 4-way power adjustable passenger seat and a 10-speaker Bose audio system with Bluetooth, SiriusXM satellite radio and a subwoofer. GM also adds memory settings for the driver's seat and exterior mirrors. In addition, the Denali gets an upgraded 5-gauge instrument cluster with an Enhanced Driver Information Center, digital compass and outside temperature indicator. Automatic tri-zone air conditioning, remote keyless entry and vehicle start, and a dual Skyscape two-panel power sunroof are among the other standard features. The Denali's OnStar system includes turn-by-turn navigation. Owners can add full navigation and a rear entertainment system as options. A fully automatic AWD system improves traction by shifting torque between the front and rear wheels based on wheel speed, throttle and road surface conditions. Power comes from a 3.6-liter V6 engine, which puts out 288 hp and 270 lb-ft of torque. It mates to a Hydra-Matic 6-speed automatic transmission and posts fuel economy numbers of 16/23 mpg. Standard safety features include 6 airbags and GM's StabiliTrak electronic stability control system. In addition, the OnStar system includes such safety features as automatic crash response and emergency assistance. GM also adds rear park assist and a rear-view camera system integrated into the rear-view mirror. Outside, unique exterior features for the Denali AWD include a signature Denali honeycomb grille, automatic on/off headlights, a rear spoiler, a rear power liftgate and heated power-adjustable side mirrors with a blind-spot mirror. GM also adds a Technology package with automatic on/off HID headlights and a heads-up display, as well as a Denali-specific Insulation and Acoustic Package that adds extra sound insulation. The 2012 Acadia Denali AWD rides on 20-inch chrome-clad aluminum wheels.